In a previous post I talked about that many women don’t lift heavy enough weights to get the results they are looking for. On the other hand, men are stupid in the complete opposite way. The biggest mistake men do at the gym is trying to lift too heavy weights too soon. Men in general are big show-offs and lift with their ego to impress their friends, but most importantly to impress girls. 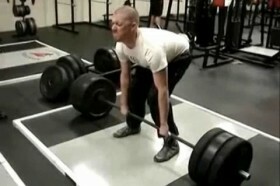 This stupid behavior is defeating the whole purpose of lifting weights; to get stronger and healthier. I see it every week at the gym, guys lifting too heavy and completely out of form. I am not saying I am better in anyway, because I used to do this too. You need to take a step back, stop for a while and ask yourself what it is you are training for, and what is your goal? Getting stronger, gaining muscle? Oh really? It’s not going to happen as long as you lift with your ego or train for someone else. Lifting too heavy and out of form kills your gains, limits your progress and will cause sustained injuries. It is going to be all pain and NO gain! Yes, you should of course go as heavy as you can, push yourself to the limit every time, but make sure that you are in control of the weights and not the other way around. If you can’t lift the weights in a controlled motion, then it is too heavy! When you let go of your ego and take back the control, then you will progress!